Becky Cloonan returns! Though I enjoyed the work of James Harren, who filled in for a few issues, I though it was excellent to see her return to this title. 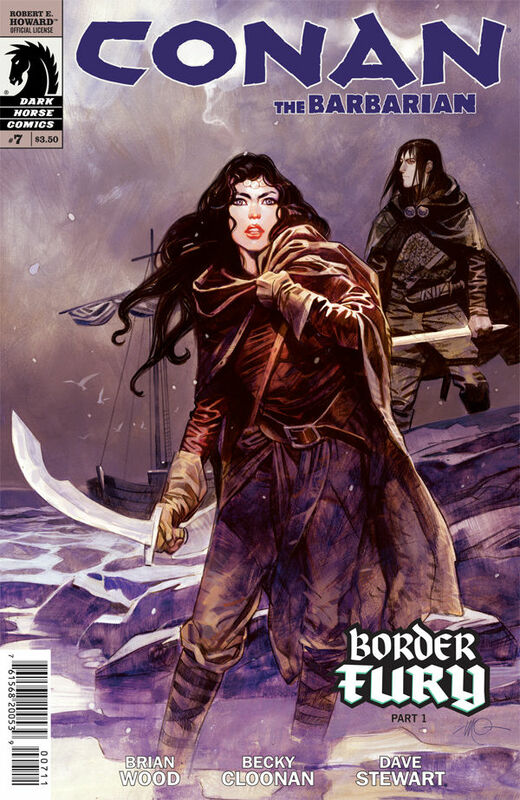 There's trouble in Cimmeria, where Conan is from. Someone is wreaking havoc, murdering and just causing destruction all over the country and acting in Conan's name. I liked seeing Conan's mother in this issue. You can tell that this is where he gets his love of tough, strong women. His mother takes no nonsense and certainly none from Belit. Normally, the depiction of Conan in this series has been a bit of a cissy boy, always yearning to be with his queen. Conan has a bit more machismo here and even confronts Belit when she wants to go all stabby on some of the local young women after they mock her. It's fascinating because we get more introspection on her since she is out of her element in this environment, which mimics the early issues about Çonan in foreign lands/waters. Everyone sees Belit as just a pretty little woman who should tend to her womanly duties and leave the mystery of the 'Conan impersonator' for the men to uncover. I don't know who he is. Nobody knows yet, but the issue ends with a grim look at the impersonator amidst another blaze of fire, which is pretty cool. Mhm, that's right. The artwork was lovely all around. Dave Stewart did the colors. He's one of my top two favorite colorists. I'm, also, enjoying seeing the different aspects to the characters. The story was great. It's a new story-line, but it kind of picks up from the last issue where Conan and Belit left Messantia, and we see where they left to go towards. There are a lot more forests. There's even snow. There was a lot of traveling to get to Cimmeria and it was interesting to see how Belit handled such brutal weather. She came across as a bit spoiled/don't-you-know-who-I-am-bow-down-to-me-before-I-stab-you. It's good that she's out of her element because it will just help the character to grow and gain much more depth.